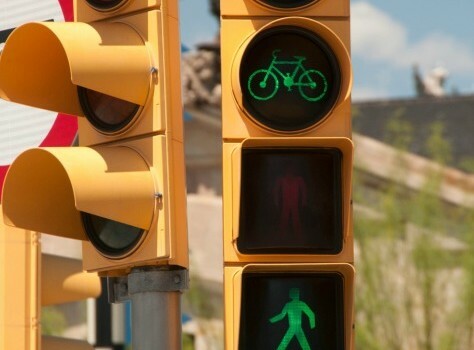 Barcelona is known for being one of the most bike friendly cities in the world. With designating bike lanes, lights and rentals throughout town, it’s not only one of the most beautiful places to see atop a bicycle, but also one of the safest. 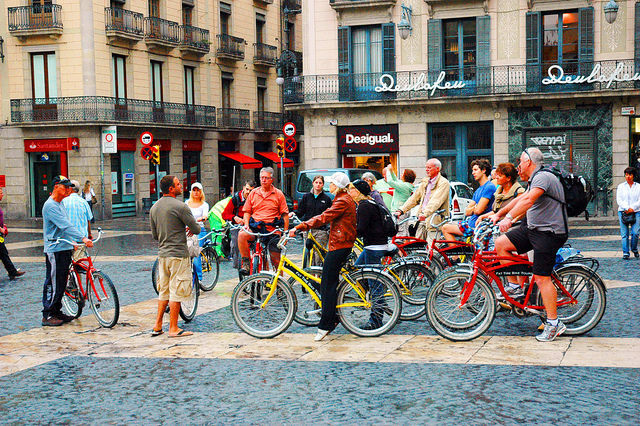 Because of the great convenience of cycling these streets, many visitors opt for one of the many Barcelona bike tours as a way to explore this place. There’s no better way to mingle exercise and sight seeing than on a Barcelona bike tour, on which you’ll get to see things you can’t from a bus. This is the classic Barcelona bike tour, taking you to all the biggest tourist sites, including the Barri Gotic, Gaudi’s Sagrada Familia, the Parc de la Ciutadella as well as Olympic Village. This four hour tour offers a break at a beach bar where riders can do some more mingling and enjoy the Mediterranean atmosphere. 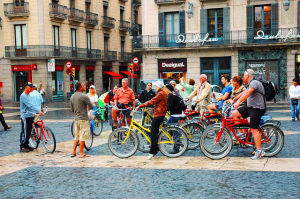 If you’re traveling with a larger group consider booking one of these private Barcelona bike tours at your convenience. Both day and night tours are offered, combining the riding with stops for drinks, tapas or whatever else your group desires. The tours are completely catered to meet your group’s expectations. Are you the kind of traveler who loves to see the local’s side of a new place? If so then this is the tour for you. This is more of a Barcelona bike ride. Forget the itineraries and factual recitations, and gear up for a back street adventure, exploring Barcelona’s hidden gems like hillside cafes, farmhouse cheese tastings, vintage shops, organic eateries and other little known treasures of city life. This tour is similarly geared around skipping the main tourist attractions in favor of seeing what life in the city is really like. Bikers will pass by some main sights on the way out to the beaches, passing through many residential neighborhoods and their daily amenities. If you like to see a city’s real street life, this is the ride for you. This tour is the perfect way to mingle culture and cuisine in an experience you can’t miss while visiting Barcelona – eating famous Catalan tapas. Along the way you’ll see some of the city’s most famous sights, with frequent stops to get a taste of the nation. This is a leisurely ride through the city that is perfect for groups of any size. If you’re looking for more than a typical sight seeing tour try one of the above Barcelona bike tours for fresh eyes on an old city. Exploring atop a comfortable city bike is a completely different experience than sitting on a bus or driving a car around. At a slower pace you’ll see more, and feel closer to the people and places you’re observing. This is also a great way to meet other travelers in town, and ones that are like-minded in their idea of adventure and fun. Barcelona isn’t just the largest city on the coast of the Mediterranean, or a Gothic and Modernist architectural treasure, but its a city of culture, intrigue and downright good times. There are numerous must see places in Barcelona from charming neighborhoods with historic buildings, to soccer stadiums and museums. In the early 1990s as industry moved off the beaches, Barcelona became the “best beach city” in the world as voted by National Geographic. 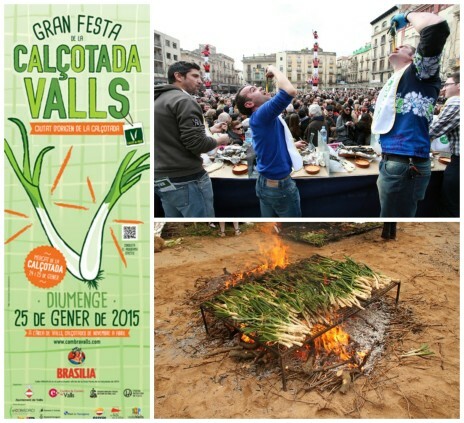 The people of Catalonia are known for their jovial demeanor and love for only the best food and drink. 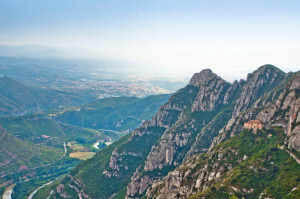 The Montserrat Mountains and Monastery is accessible by both car and train from the city. 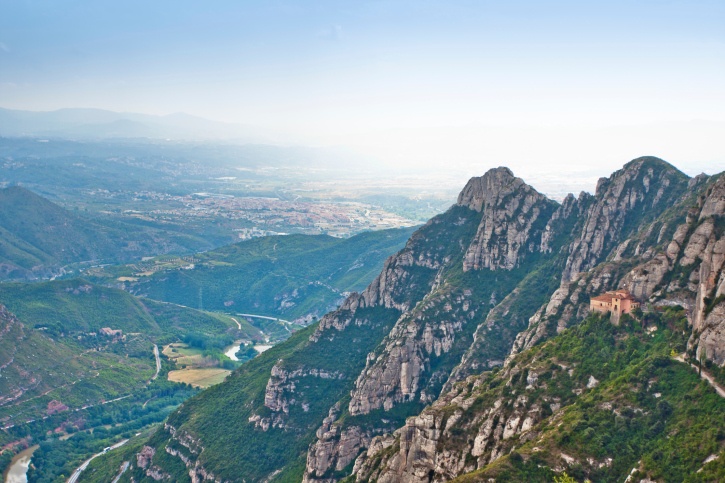 This mountain sanctuary is a pilgrimage destination and a cultural center displaying the deep Catholic roots of Barcelona. Visit their museum and gallery and learn about its rich spiritual and cultural history, or take a hike on one of its many mountain paths. Barrio Gotico is the Gothic quarter in the old city of Barcelona, many of whose buildings date back to Medieval times and even as far back as the old Roman settlement. Roman Wall remains can be seen throughout the quarter’s labyrinthine streets. Though it has been largely restored, the Barrio Gotico will bring you back in time. Las Ramblas Street is a tree-lined pedestrian street right downtown, stretching from the Placa de Catalunya to the Christopher Columbus Monument. Its outdoor cafes and great shops attract locals and tourists alike. Enjoy a good book and a drink at one of the cafes, or take in the city’s unique architecture on a stroll down this beautiful street. If you’re an art appreciator you definitely want to head to the Picasso Museum Barcelona, which is home to much of Picasso’s earlier works giving visitors a sense of the his formative years. The Museum has free admission on Thursday evenings and offers special events including classes in fine arts and art history. La Sagrada Familia Church, although unfinished, is another one of the must see places in Barcelona. The construction began in 1882 and was taken over by Gaudi a year later, who worked on it until his death in 1926. It is an expiatory church with extravagant design, resulting in the 133 years of construction. Regardless of its incomplete state it is one of the most visited places in Barcelona and its unfinished 18 towers are among the most popular landmarks in the city. While here to explore these and many more must see places in Barcelona, be sure to book your ideal short term rental. If you’re traveling with your family, or alone, one of our modern flats located around the city can easily accommodate you. We have properties of all sizes and layouts available, and many of them have private pools. Their comfortable decor will help you feel at home here in Barcelona, lending to your enjoyment of this wonderful Mediterranean city. The summer in Barcelona, while humid, is significantly cooler than other Spanish cities, making it a perfect Mediterranean retreat for anyone looking for a getaway during the warmer months. Whether you’re looking for a good place to spend summer vacation with the kids, or just need a change of scenery for a few months, Barcelona will prove to be the perfect destination to meet your desires. Many locals head out of town from late July through early September, leaving visitors with a city open to their every whim with less traffic and fewer bodies. Barcelona is the epitome of Mediterranean charm with its expansive beaches, and yet also displays the culture and design of any northern ancient European city. It’s draw is in its inviting streets begging you to meander about, so leave the itineraries at home, book a short term rental, and spend a healthy chunk of your summer in Barcelona. 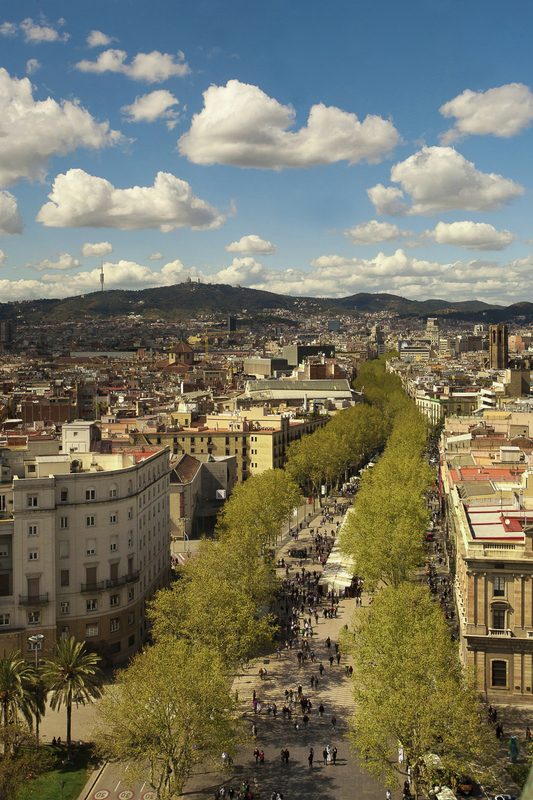 Here are some of the great things to look forward to during summer in Barcelona. The Primavera Sound Festival in late May brings together music from different genres. From rock legends like The Strokes to pop artists and indie bands like The National, this is one the world’s best music festivals. Come June two other exciting annual festivals role around. The Dancing Egg takes place around the Corpus Christi at various churches to celebrate fertility and rebirth. Another summer favorite is the Sónar Festival, which is Barcelona’s International Festival of Advanced Music and New Media Art. Barcelona’s famous Parc de la Ciutadella is home to a boating lake, a waterfall, playgrounds and the city zoo. This is a favorite hang out during the summer in Barcelona, and is both a great place for a walk, to to just let the kids run around. Parc Güell is a surrealist park designed as a city garden in which the gardeners could live, giving it the air of fairy tales. Before the last couple of decades the beach was not at the forefront of the city’s landscape or experience. Barceloneta Beach was made a reality during the 1992 Barcelona Olympics, and is now a central aspect to summer in Barcelona. This beautiful coastal destination is known as Catalunya’s party town. Just a 40 minute train ride down the coast from the big city, it makes for a great day trip where you can explore its various beaches. Many of the Museums in Barcelona hold Nits d’Estiu (Summer Nights) events throughout the months of July and August. They keep their doors open late and host concerts, special exhibits and other fun events. CaixaForum is known to be one of the best nighttime programs during the summer in Barcelona. If you’re planning a summer getaway to Barcelona you won’t run out of great things to do in this beautiful and culturally rich Mediterranean city. Bizflats has many great properties throughout the city suitable for you regardless of how many people you’re traveling with. Our short term rentals are conveniently located, elegantly furnished and perfect for a summer in Barcelona. Our properties can be found on La Rambla, at Barceloneta Beach, and we even have a country Villa just outside the city. The prices range depending on what you’re looking for but the quality is always excellent. We look forward to helping you find the perfect accommodation for your summer in Barcelona. Barcelona is an innately romantic city with tons of romantic spots. Historic monuments contrast modern design, and the whole city is cornered against the beach by lush green mountains. A city devoted to food and wine, there are date nights to be had in every hole-in-the-wall tapas restaurant you find. Tapas themselves are meant for sharing, served in small two-bite portions, and always paired with some national treasure of a wine or beer. Romantic restaurants in Barcelona aren’t hard to come by, and this city built for romance also offers other fashions of dining – excursions, really – that will give you and your sweetheart an experience to remember whenever you visit. No matter what your taste, you’re sure to find plenty of romantic spots to eat in Barcelona. Below are a few of our choices for the most trendy restaurants in Barcelona. For a classic Mediterranean tasting menu, book your reservations at Con Gracia. This small, tasteful restaurant is elegant, intimate, and the perfect for romance. Joséphine is a charming café and comptoire. Their vintage style features a simple, yet delicious Mediterranean menu accompanied by tasty cocktails and often live jazz music. If you’re looking to keep it simple and a little eclectic this is a great option. For one of the cities best gastronomic experiences head to Mayura for interesting mix of Mediterranean and Indian cuisines in a relaxing environment. You won’t be disappointed by their fantastic cocktail list either. One of the new additions to the scene of romantic restaurants in Barcelona, Toto is known for great taste in both spectacular designs and an outstanding Italian-inspired menu. If you’re looking for an exquisite dining terrace then book your romantic dinner at Roig Robí. This is not only one of the most romantic restaurants in Barcelona, but also one of the most traditional with a menu boasting an unique and delicious interpretation of high Catalan cuisine. If you’re looking for more than just a meal and some spectacular views of our gorgeous city, then this hot air balloon ride, which includes a traditional Catalan brunch, is a great way to celebrate a romantic holiday in Barcelona. Surprise your better half with this Barcelona birds eye trip and you’ll give the most exceptional gift – experience to share. In the spirit of experiential dating, plan a night of cooking fun. This is a great twist on the traditional Valentine’s Day event, grouping activity with fine dining. Sign up for this Small Group Barcelona Cooking Class and learn the secrets of Spanish cuisine and master tapas dishes or paella. At the end of the challenge, led by a personal professional chef, enjoy the fruits of your labor among loved-ones. This traveling Michelin-rated dining experience is among the most unique ways to experience the city’s views, culture and cuisine. Hop aboard the glass-roofed Gourmetbus and get a tour of Barcelona, accompanied by a famous Carls Gaig meal. The numerous romantic restaurants in Barcelona to choose from will not disappoint you during your romantic occasion, nor will the amazing date-night activities about town. If you’re planning a special trip to celebrate the holiday with your sweetheart check out some of our romantic flats scattered about the city and surrounding countryside. This is a day for making memories, so make it special!